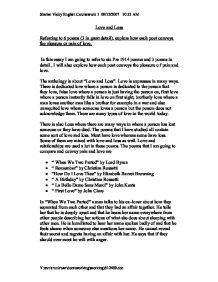 Love and Loss Referring to 6 poems (3 in great detail), explore how each poet conveys the pleasure or pain of love. In this essay I am going to refer to six Pre 1914 poems and 3 poems in detail , I will also explore how each poet conveys the pleasure of pain and love. The anthology is about "Love and Loss". Love is expresses in many ways. There is dedicated love where a person is dedicated to the person that they love, false love where a person is just having the person on, first love where a person instantly falls in love on first sight, brotherly love where a man loves another man like a brother for example in a war and also unrequited love where someone loves a person but the person does not acknowledge them. There are many types of love in the world today. There is also Loss where there are many ways in where a person has lost someone or they have died. The poems that I have studied all contain some sort of love and loss. Most have love whereas some have loss. Some of them are mixed with love and loss as well. Love and relationships are used a lot in these poems. The poems that I am going to compare and convey pain and love are * " When We Two Parted" by Lord Byron * " Remember" by Christina Rossetti * "How Do I Love Thee" by Elizabeth Barret Browning * " A Birthday" by Christina Rossetti * " La Belle Dame Sans Merci" by John Keats * " First Love" by John Clare In "When We Two Parted" a man talks to his ex-lover about how they separated from each other and that they had an affair together. He tells her that he is deeply upset and that he hears her name everywhere from other people describing her actions of what she does about sleeping with other men. ...read more. The tone of the poem is like the tone of "A Birthday". In "A Birthday" the tone of the poem is cheerful and heart-warming. The lines in the sonnet most of them are similes e.g. "my heart is like an apple tree. This tells the reader that her heart is growing and blooming. The similes in this poem are used to make the reader imagine them in his mind as if they were real. However in "How Do I Love Thee" it is not used that much. In "How Do I Love Thee?" the woman is portraying her love very vividly to the reader "by sun and candlelight". This tells the reader that her love for him is positive and jovial. The woman wants her love to be natural and also love him purely as well passion "love thee freely", "love thee purely" and "I love thee with the passion put to use". This tells the reader that the woman loves the man not with forced love but with ordinary love and that she loves him with the sole purpose loving him with infatuation as well indicating that she is obsessed about him. The reader is assured that the love is true in this poem and nothing can affect it. The woman in "A Birthday" says that "my heart is like a rainbow". This is another simile and tells the reader that she is making the atmosphere of the birthday seems miraculous and colourful like a rainbow shining on a wet day. She then speaks "my heart is gladder than all these". This tells the reader that the woman has something better than all of the items she said she was like and as she says "because of my love is come to me". This tells the reader that her lover is coming back to see her and that this is happier than all the other things. ...read more. He wakes up and finds it is winter. In the last stanza the knight repeats what the narrator said "and this is why I sojourn here". This tells the reader that he has waited a long time to awake. The two poems are similar because they display the same feelings that are in each. The language in both of these is also archaic. They make the poem feel old. They both are related to because of their conveyance of the mixture of pain and love that are expressed in each of them. My conclusion is that these six poems are all linked together as they all describe the feelings and emotions of love. I think that the key difference between these six poems is that they all have different endings. All poems are effective in expressing their ideas relating to the theme of love. I clearly understand the poet's description of love. All of the poems are related to real life experience. Lord Byron relates his poem because of his rejection by Lady Caroline Ponsonby. Christina Rossetti relates her poem because of her love for her grandfather and for the amount of birthdays she had. Elizabeth Barret Browning relates her poem for her love for her husband Robert Browning. John Keats relates his poem because his mother dieing and John Clare relates his poem to when he was rejected by a rich farmer's daughter. My favourite poem is "When We Two Parted" because it moved me because of his emotions towards the woman he loved and that he rejected him as well as playing him along. I found it easy to analyse as all the others were a bit to hard to understand. I liked the fact that the ideas and his emotions went a lot deeper that I first appreciated. The poet gives out the real emotions a person feels after they have separated from them and how it affects them. I like this poem because it tells the truth of how painful love can be. 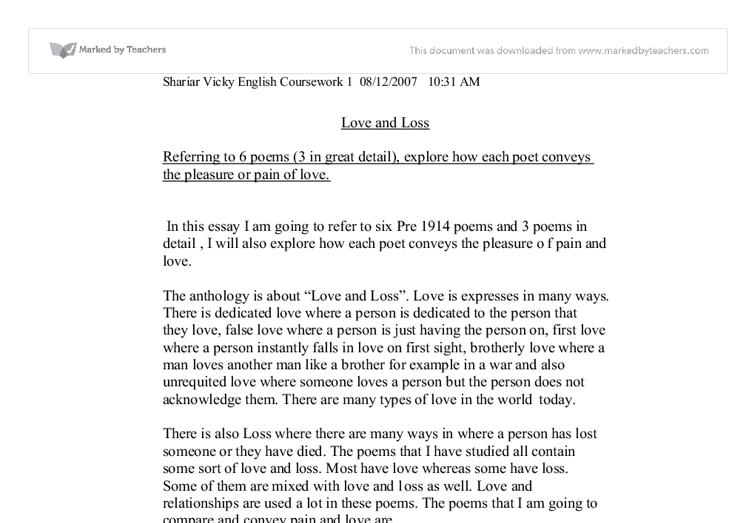 Shariar Vicky English Coursework 1 08/12/2007 10:31 AM C:\Documents and Settings\Shariar\My Documents\Coursework For English\Love and Loss.doc ...read more. This is, perhaps, the best description of true love, showing Elizabeth Barrett Browning's infinite degree of feeling for her love. It stretches in all directions as shown by the enjambment which prolong the emotions as far as is possible and may possibly suggest a love so complete it is in a new dimension. Lord Byron uses the words of 'When we two Parted' to catch the readers attention. Alliteration is applied to give importance to the line, "Colder thy kiss". The word colder is used to express the love loss between the two people, and the alliteration is in the repetition of the 'k' sound, to emphasise the emotions. In relation to 'The Highwayman' where the deaths are both suicides, Beth kills herself to help save the highwayman's life, her true love; this is shown in this stanza of the poem: "The tip of one finger touched it. She strove no more for the rest. That's why I thought that the Duke is more obsessive with his power over the lower rank than it actually is with his wife. The next poem is "How do I love thee? Let me count the ways". Elizabeth Barrett Browning is the only female poet among five others. probably uses such a negatively powerful result to emphasize on the harmful aspects of such a relationship. Also, this poem follows a strict rhyme scheme and has a conversational rhythm. It is written in iambic pentameter, which probably conveys the conflict within himself between what he says and what he really is - a murderer!